Welcome to our Georgia State Facts section, part of an educational project designed to provide information about indigenous people in different U.S. states. Follow the links to the right of our tribal map for more information about the language, culture and history of each Georgia tribe, or scroll below the map for Georgia Indian activities including a wordsearch, fact sheets, and words from the Native American languages of Georgia. Feel free to print any of these materials out for classroom use! There are no federally recognized Indian tribes in Georgia today. Georgia's Native American tribes were evicted from the state during the 19th century, despite a Supreme Court ruling that it was unconstitutional to force them to leave. Most tribes that once were native to Georgia ended up on Indian reservations in Oklahoma. If you click on the link for each tribe above, you can find more information about them. Georgia Native American Word Search: Printable puzzle hiding the names of Georgia's Indian tribes. Georgia Language Greetings: Learn to say "hello" in several Native Georgia languages. Georgia Native Animals: Learn the Native American names of Georgia animals. Georgia Indian Facts for Kids: Answers to frequently asked questions about the tribes of Georgia. We currently have pages for the Cherokee, Miccosukee, Cherokee, Yuchi and Shawnee tribes. Archaeology and History of the Native Georgia Tribes History of Georgia's tribes from Paleo-Indian times to the present day. The Georgia Gold Rush: Interesting history of the effects of gold mining on Georgia Native Americans. Georgia Indian Dictionary for Kids: Book on Native Americans in Georgia for grade-school kids. Encyclopedia of Georgia Indians: Thorough reference book about the Native American tribes of Georgia. The Politics of Indian Removal: History of the forced relocation of Alabama and Georgia Creek Indians to Oklahoma. Cherokee Nation V. Georgia: Native American Rights: A good book on the Indian Removals of Georgia for younger readers. Only The Names Remain: The Cherokees and the Trail of Tears: History of the Cherokee Indians in Georgia. Antiquities of the Southern Indians, Particularly of the Georgia Tribes: Book of prehistoric Georgia Indian artifacts. 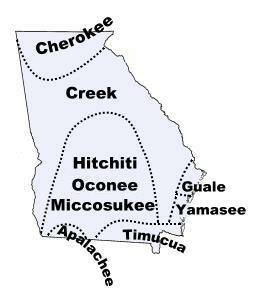 Native Americans in North Georgia: Extensive information on Georgia Indian history and prehistory. Georgia's Indian Heritage: Archaeology of Georgia, with prehistoric artifacts and maps. Indian Removal Act of 1830: History of the eviction of the Cherokees and other Indian tribes of Georgia. Cherokee Nation v. Georgia: The legal decision in favor of the Georgia Cherokee Indians written by John Marshall. Would you like to sponsor our nonprofit work on Georgia languages?